Teachers all over the country need to be recognized and honored in this special day set aside for them, October 5 in collaboration with the celebration of World Teacher Day (WTD). 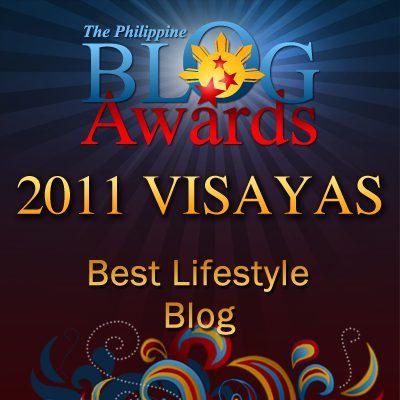 In our division, we do this through a humble way of awarding them. 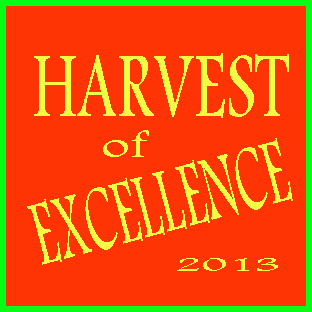 We call it as "Harvest of Excellence" to recognize the exemplary, meritorious and even outstanding accomplishment of school, teachers, school administrators in academic excellence attained by the teachers concerned. 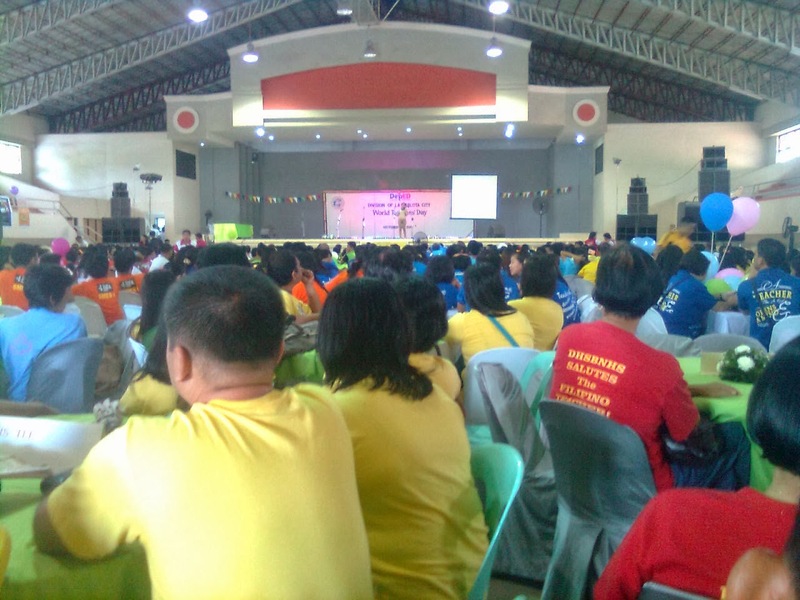 Just imagine, more than eight hundred teachers, both Elementary and Secondary level, of the small division of La Carlota City are all excited for the honor given them by the division along with the blessings of the city government through Mayor Juliet Marie Ferrer. Awards given may include the following outstanding National Achievement Test (NAT) in Grade III and Grade VI, consistent division unified test achievers in all subject areas, outstanding principal and department head. Major awards have a corresponding cash award. 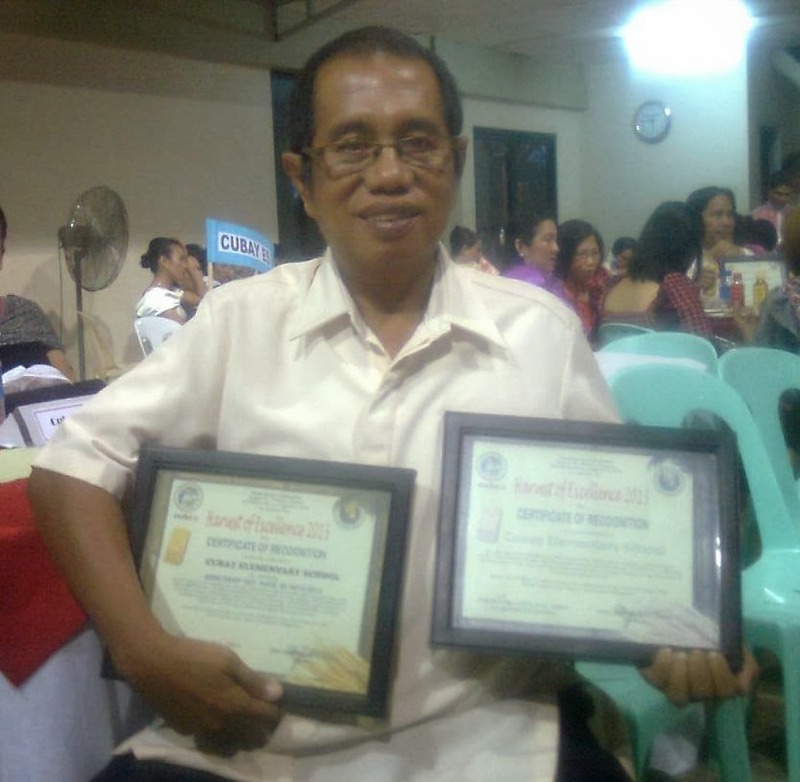 In district I, Mr. Rolando Heria of Balabag Elementary School was adjudged the outstanding school principal in elementary. He is followed by Mr. Petronilo Bartolo of Nagasi Elementary School in district II. And Mr. Efren Otico of San Miguel Elemenary School I is outstading principal in district III. In the secondary, Mr. Denny Castañeda, principal 3 of Doña Hortencia Salas Benedicto National High School. He just retired recently. And Mr. Erle Arbado of DHSBNHs was named as the outstanding department head in Social Studies. La Carlota Schools Division Superintendent Portia M. Mallorca takes time on stage to welcome every teacher who gets inside the gym after more than an hour of parade around the main streets of the city. She salutes the teacher for a job well done in doing their routine job in teaching their pupils and students. They do deserve to be called as the hero of instilling the quality education to their students and pupils. Therefore, she says they deserve to be given honor and recognition for such invaluable services they render as classroom teacher. As the program starts, the gym is full of teachers donned in their best Filipiniana attire for the occasion. The female teachers look so native in their Maria Clara outfit. The male teachers clothe in Barong Tagalog apparel. The Cubay Elementary School in which I am the school principal comes out outstanding too in performance for achieving a zero drop-out rate in school year 2012 - 2013, and attaining an increase of mean percentage score (MPS) in the national achievement test (NAT) in grade VI. Our two teachers, Mrs. Mary Ella Amar is consistent achiever in Filipino and HEKASI, and Mr. Mario A. Malacaman is highest achiever in grade 4 mathematics. A day before, World Teachers Day, our school has honored the teachers. The parents, guardians, and the officers of parent-teacher's association (PTA) of the school held a simple program to honor all the teachers. Teachers have received memorable gifts from the PTA, and inspiring greeting cards and bouquet of flowers from the pupils. PTA president Racquel D. Angelitud says teachers should be recognized and should be honored for they do a "crucial role" in educating, imparting knowledge to their pupils and students. In doing so, their sacrifices, their efforts are fully compensated and they feel happy about it. They are one in saying: "Happy Teachers Day!" Teachers are united and they are one in this WTD celebration. profitable to you. The first step before bidding on any of these keywords is to make your website relevant in the eyes of Google. What we are going to be doing is called - A "domain masking". paid for the ad. But not too long ago I stumbled on one of the few legit ways to make money with your computer - from home. In a bureaucracy the cream does not usually rise to the top. Get courses and take classes on the skill you want master. And don't worry, you can make a website and submit articles for free, and it is actually pretty easy. make money with Ad - Sense. There are similar lists of search terms that relate to all other trades and professions. and 2 search boxes per page.